I love Mexican food and there is a lot of it here in Los Angeles. The border is only 2 1/2 hours south by car. This soup is just as good -better actually- than the restaurant versions I have eaten. It tastes very autentic and is really simple to make. You can use as many or as few toppings as you like. The original inspiration came from Healthy in a Hurry. 1 pound / 450 gr chicken, app. Cut the chicken into strips and fry in a skillet with 1 tbsp olive oil. Season. Set a side when done. 5-8 min depending on size. Put 1 tbsp olive oil in a pot and fry sliced bell pebers and onion with cumin. 2-3 min. Add chicken broth, tomatoes, corn, beans and lime juice. Bring to a boil and cook about 5 more min. Season and serve with toppings of your choice. Buen provecho! You don’t have to blend the soup, it is just more chunky, if you don’t. It is simply a matter of preference. Leave out corn and beans, if you don’t have that ready in your pantry. It will still be good. You can also make it vegetarian by leaving out the chicken. 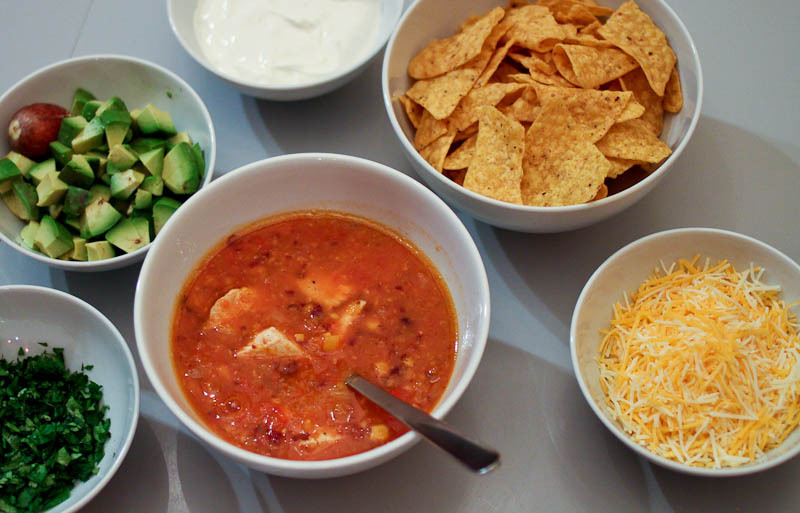 This entry was posted in Dinners in 30 min or less, Latin flavors, Poultry ideas, Soup time and tagged beans, chicken, cooking, dinner, Dinner in 30 min, healthy food blog, mexican food, mexikansk suppe, recipes, tortilla soup. Bookmark the permalink. Great food page and very inspiring photos – nice! Yum, I can’t wait to try this soup, it should be a hit with my kids!